Every summer for the past 10 years or so my family has enjoyed a fun Saturday night at our friend’s big annual Luau party. For the past several years I’ve had the fun job of making dessert for all of the party guests… all 100 or so! When the party invitations go out, the guests are asked to bring a dish to share, but no dessert… that’s my job! =) I usually make 3-4 different items, and I like to make a few different things each year. In past years I’ve made Pina Colada Cupcakes, Coconut Snowballs, Cupcakes with pretty fondant flowers, and lots of different decorated cookies including Floral Luau Cookies, Grass Skirt Cookies, and Hibiscus Flower Cookies. This year, one of the new recipes I added to the dessert menu was this delicious recipe for Kahlua Cheesecake. I used my Mini Cheesecake Pan to make 12 perfect little cheesecakes. 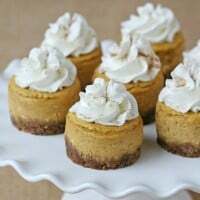 Making cheesecakes in a mini cheesecake pan is a little bit of extra work initially, but they look extra nice in a dessert display and make a perfect small serving. 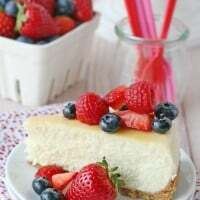 Feel free to double the listed recipe to make one large (9″) cheesecake, but since I have not done that with this recipe yet, I’m not sure of the baking time. 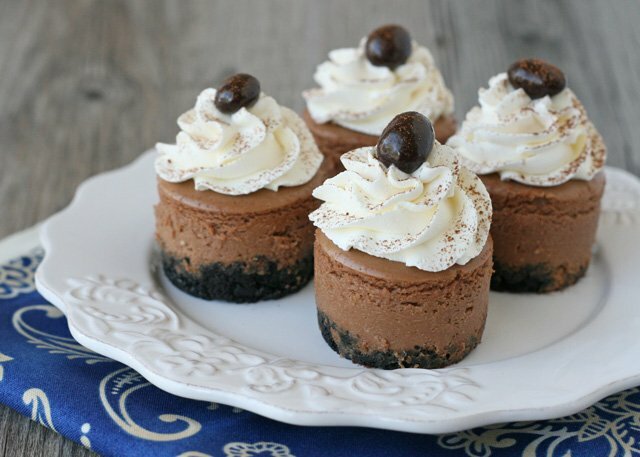 This rich and delicious Kahlua Cheesecake recipe makes 12 mini (2") cheesecakes. Prepare the cheesecake pan by rubbing the inside of each cheesecake well with a lightly oiled paper towel. Melt the butter in a small bowl. Place the oreo cookies in a large ziplock type bag, and crush using a rolling pin. Place crushed cookie crumbs in a medium sized bowl and combine with melted butter. Add about 1 tablespoon of the crust mixture into each of the 12 mini cheesecake wells. Pack down the crumbs using a shot glass or glass spice bottle. Bake crust for 10 minutes in preheated oven. Melt chocolate in a small bowl and set aside. In the bowl of an electric mixer, blend cream cheese until very smooth. Add sugar and continue to blend until fully incorporated. Add egg and vanilla, and continue to beat, scraping down the sides of the bowl as needed. Add melted chocolate, and blend. While blending, add Kahlua. Beat an additional 30 seconds or so. Reduce the oven temperature to 250*F.
Open a large ziplock bag and place it in a large glass, pulling the sides of the bag down over the glass. Add the cheesecake filling to the bag, then close the bag. Snip off one corner of the bag, and fill each well of the cheesecake pan a bit more than 3/4 full with filling. If there is a bit of extra filling, you can bake it in a small ramekin for a little "tester"
Place cheesecake pan in the 250*F oven and bake cheesecakes until the filling is set, 22-25 minutes. Place the pan on a wire cooling rack and allow to cool to room temperature, then place entire pan in the refrigerator about 4 hours before removing cheesecakes from the pan. Once cool, carefully remove the cheesecakes from the pan (pressing up on the removable bottom of each well). Keep the cheesecakes in the fridge until ready to serve. 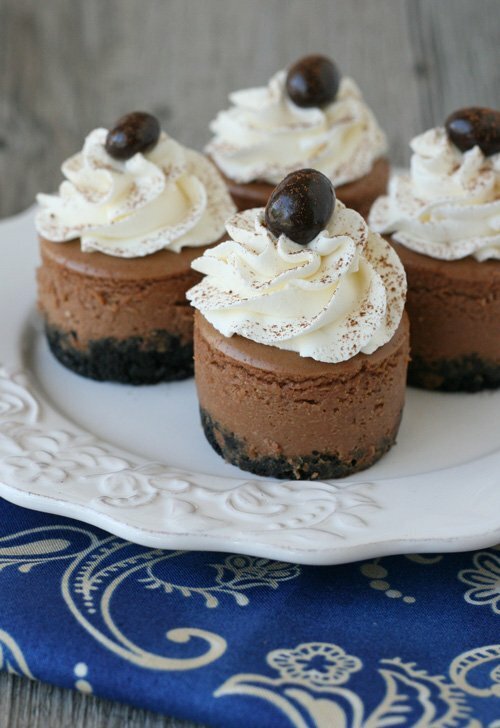 Garnish with whipped cream, a chocolate covered espresso bean and a sprinkle of cinnamon or cocoa powder. 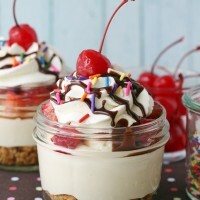 The cheesecakes may be made up to 2 days in advance, and kept (in a closed container) in the fridge. I used Challenge brand butter and cream cheese, please feel free to use any high quality brand of our choice. If you follow me on Instagram you’ll see a peek of the other desserts I made for the Luau party, including Chocolate Cupcakes, Pina Colada Cupcakes and Almond Joy Bars. Challenge Dairy is once again partnering with UNICEF to build awareness around childhood malnutrition and to allow others to help out. As part of their “Pin a Recipe, Feed a Child campaign, for every recipe re-pinned from this board, Challenge will donate a meal to UNICEF for a child in need. Hop on over to their Pinterest board and re-pin your favorites! These look amazing! I’m thinking about making these for diner en blanc – do you think they would hold up (minus the topping) in a cooler for a couple hours? I used to make something like this for holiday parties at work. If you don’t like chocolate crusts, try an almond crumb crust (I use Bob’s Red Mill Super-Fine Almond Flour), also very good with the choc/Kahlua filling combo. Do you think these would freeze well? They sound delicious and are SO pretty! You should make a video making this!! Looks so good!!! Are these very rich? I want to make these but i’m worried they will be too chocolatey and rich. 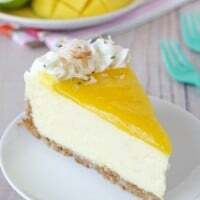 Glory, this recipe is divine!!!!!!!! I ended up making a half almond flour/ half toasted pecan chocolate crust, to make it gluten-free. I also made 2 packages of cream cheese worth, and adjusted the other ingredients, accordingly. My Bunco group tomorrow night is going to die! Where do,you get mini cheesecake pans! Can this be converted into a regular cheesecake pan size? Hi, just wondering if this recipe would work in mini cupcake liners. They would be significantly smaller than 2″ so I wondered if you think I could follow these same instructions for that size? I’ve not experimented with the recipe in any size cupcake liner, but have had several readers make them successfully in standard sized cupcake liners. I’d be concerned that the mini ones would be a bit tedious to make, and if any cheesecake stuck to the liners you’d have so little left to enjoy. Please feel free to experiment, but I might recommend standard sized cupcake liners to start. If I prefer to use already made oreo crumbs, how much would I use? This recipe looks delicious & will be perfect for Christmas dessert! Hi Tarra, I’m so sorry you didn’t use the recommended pan. I’m not sure what to suggest at this point. I do hope you give the recipe another try. 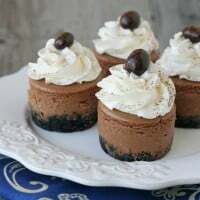 I have had readers make the recipe successfully using cupcake liners and a standard cupcake pan, but I have only made the recipe as listed, with the mini cheesecake pan listed. I have heard people talk about spraying cupcake liners lightly with non-stick cooking spray. Maybe try that. Or silicone ice cube trays work. Once again, spray lightly with cooking spray. Hope this helps. Happy baking.